To start, I made a paper template of the shape I wanted for my changing mat. I based it off a store-bought one that we have used with our previous children. I had to change the size slightly though, as the Heat-N-Bond Iron-On Vinyl is only 17" wide. 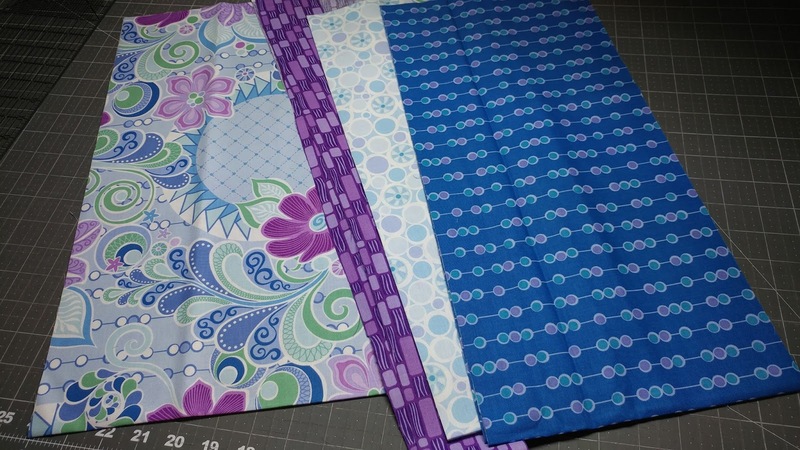 I cut the fabrics for the inside and outside of the mat slightly wider and longer than the template. I applied the iron-on vinyl to the inside fabric - Flying Geese in White. This product is clear and turns the fabric into a water-resistant fabric! 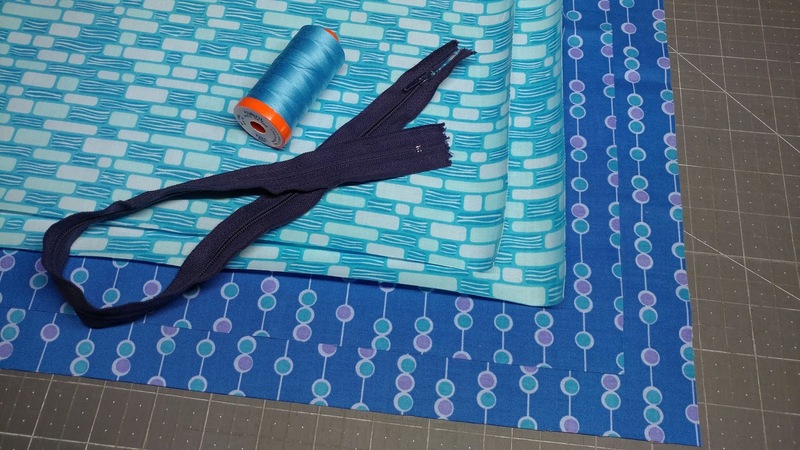 I pin basted the outside fabric - the Feature fabric in Aqua - with two layers of Warm & Natural batting but with no backing fabric (I didn't want to quilt through the vinyl fabric). I used tape to mark the approximate area that I would need to quilt based on my template. I had planned to do all the quilting with my new longarm, but the fabric designs are a bit small for what I thought I could do accurately (Amanda Murphy does make some great fabric for longarm free motion practice though too!). 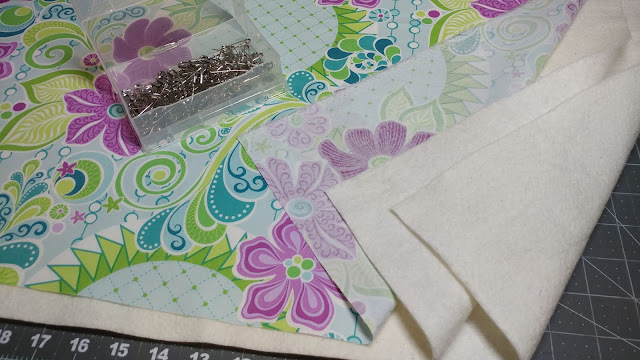 I wanted to be able to be up close and personal with the fabric to be able to quilt some of the more intricate designs, so I decided to use my domestic machine (a Juki TL-2010Q) for all the sewing and quilting with these projects. Then I free-motion quilted the feature fabric following the designs in the fabric. I used Aurifil 50wt Shining Green #5017. It's so great to be able to do so many free-motion designs, but have the help of a pattern to follow! 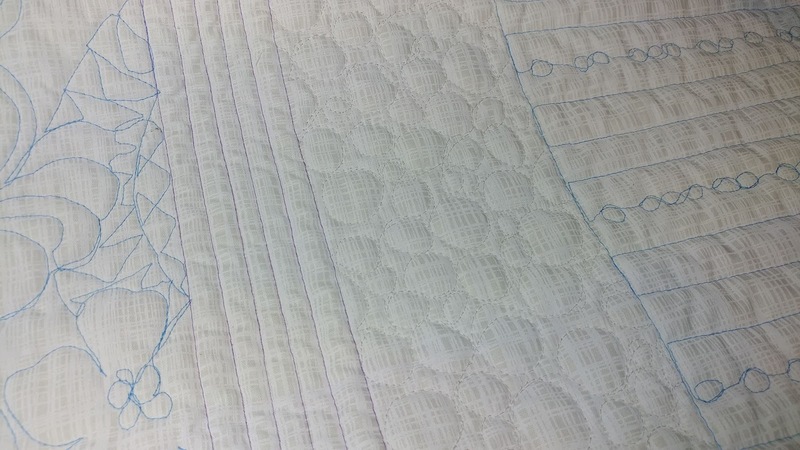 Once quilted, I used the template to cut both the quilted panel and the vinyl inside fabric to the right shape. I used my walking foot to stitch around the outside edge to secure both pieces together. I used a piece of the feature fabric to make two pockets. I just hemmed both ends of the fabric, and placed it where I wanted it. I also used my walking foot to stitch a straight line through all layers (including the vinyl fabric this time) in each place I wanted the mat to fold. Then I cut bias binding from the Flying Geese in Magenta fabric and sewed it to the mat using Aurifil 50wt Medium Lavender #2540. I absolutely LOVE how it turned out! 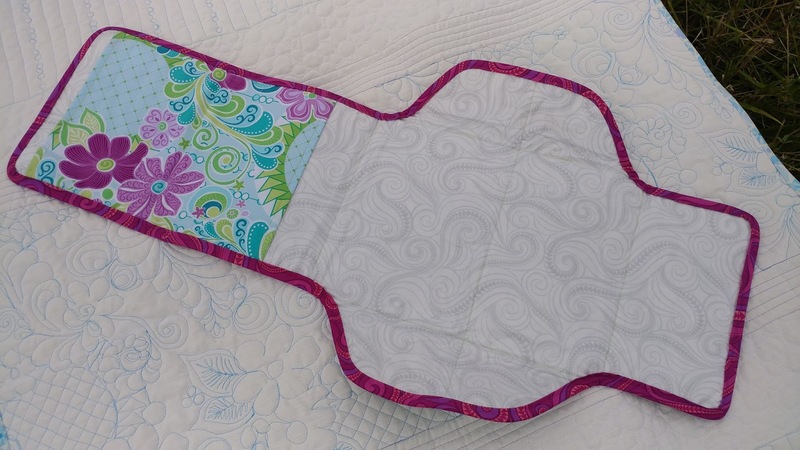 The double batting makes the quilting texture amazing (plus it will give extra cushion when baby is laying on it!). Once the changing mat was finished, I still had other fabric to play with! I decided to make a nursing cover - something I've made for each baby (but hadn't made for this baby yet!). 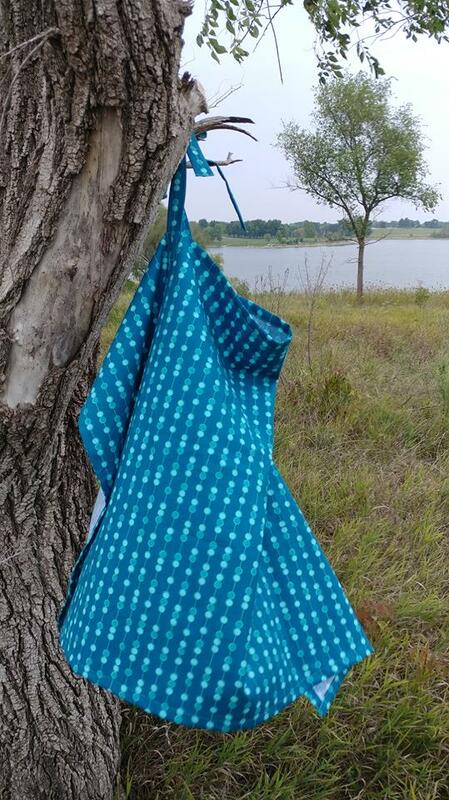 From just one yard of the Teal On a String fabric, I cut a 26"x38" rectangle and two 2 1/2" x 20" pieces for straps. I hemmed all four sides of the rectangle and sewed the strap pieces into tubes. After turning, I sewed the straps onto the main rectangle about 12" from each end. Then I just tied the straps into a bow, and it's ready to use! I still had some of the iron-on vinyl left, so decided to try making a wet bag. A wet bag is a zippered pouch with a water-resistant lining. They can be used to hold wet swim suits after the pool, or dirty cloth diapers until laundry time. We use them a lot at our house! I prepped the inside fabric (this time Bricks in Sky Blue) with the iron-on vinyl and cut the exterior pieces from On a String in Cobalt. 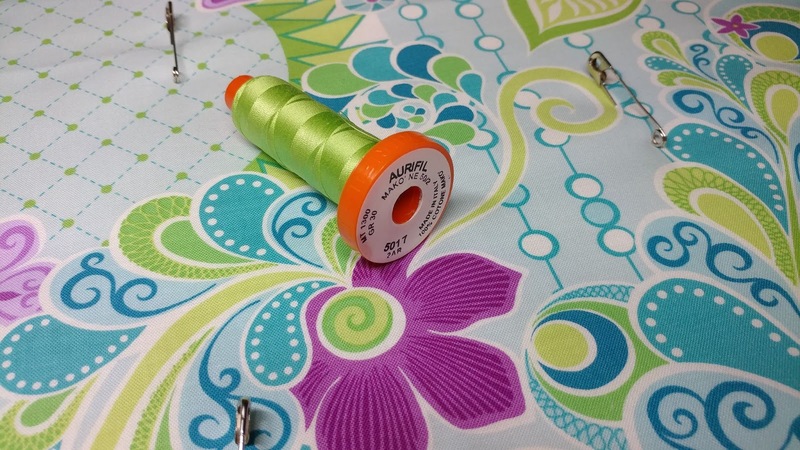 I had a navy zipper that would work well, and Aurifil 50wt Bright Teal #1320. I also cut a strip from the Bricks fabric to use as a strap. Loosely following the tutorial here, I made a wetbag that measures 13"x16" - perfect for throwing in the diaper bag on the go! I added a snap to the strap so it would be a loop for hanging on a door knob or snapping around a stroller handle. I want to make many more of these now! But I still had fabric left! 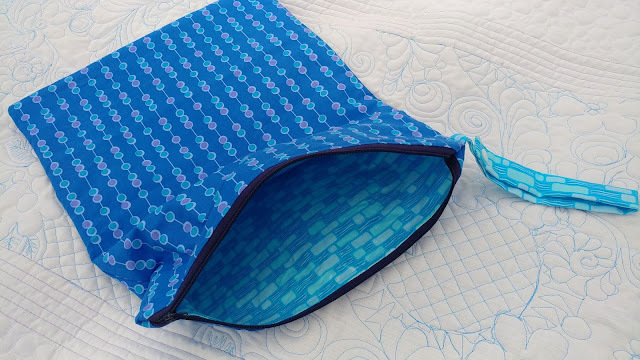 I really wanted to try making a quilted diaper bag, but I just couldn't find a pattern for one I loved. I decided to make something I would love making instead - a quilt! I cut four of the fabrics (the Feature print in Blue, Bricks in Purple, Pebbles in Blue Pale, and On a String in Cobalt) into WOF strips and sewed them together for a quick quilt top. This time, I wanted the fabric and quilting to be the focus of the quilt - not the design of the quilt. I pin basted the top with two layers of batting and a remnant of Hand Drawn Lines backing fabric that I bought from Connecting Threads. Then I quilted the life into it. 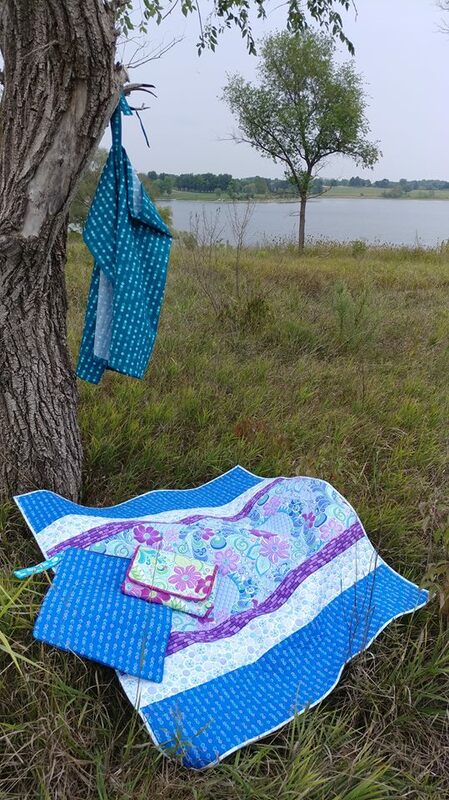 I started by quilting the center feature fabric print with Aurifil 50wt Bright Teal #1320 on my domestic machine. 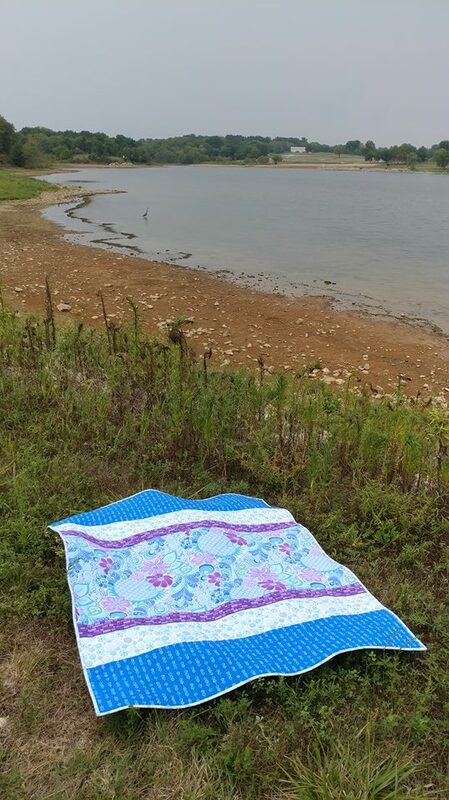 Next, I used my walking foot to quilt straight lines on the purple bricks with Aurifil 50wt Medium Lavender #2540. Using Aurifil 50wt White #2024, I quilted the pebbles next. I used the Pebbles in Pale Blue fabric for 2 1/4" binding (and machine stitched it on like usual). The finished quilt has such an amazing weight and texture! I sure wish you could feel the texture from the pictures! I really can't express how much I enjoyed quilting the Free Motion Fantasy fabrics! 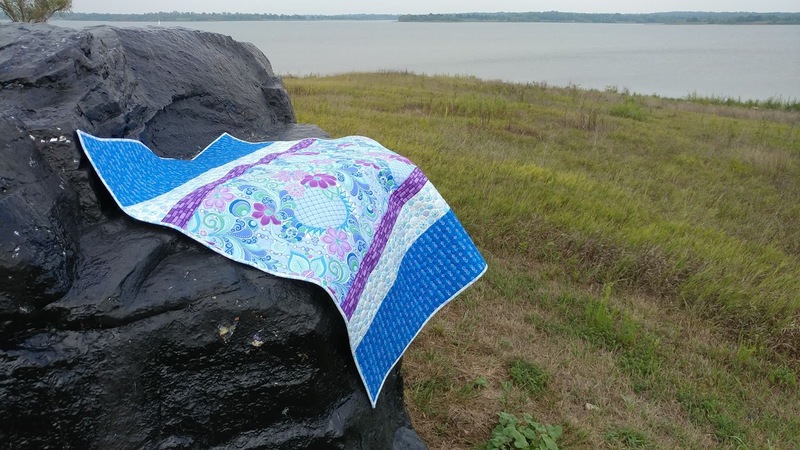 The fabric is beautiful - and also helps you free motion quilt! I'm also excited to have several custom things ready for baby! I still have a few scraps left over - and I am already looking forward to using them! Now for the giveaway! Giveaway closed. Definitely the nervous nellie. I am just starting to play. I am still a nervous nellie, but hoping to moving become an eager beaver soon! I'm always nervous to start the actual quilting, until I get started. After that I'm all in. I rarely rip quilting stitches. I figure the ultimate purpose is to hold the layers together. So if it's not perfect, and it never is, what difference does it really make. Congrats on the new baby! 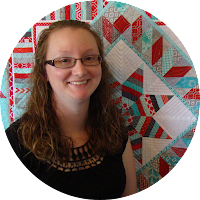 I am a very nervous Nellie when it comes to free motion quilting! I am so afraid I am going to mess up the quilt top and not be able to fix it. These fabrics look so fun for learning! You can label me a nervous nellie. I always promise myself I will doodle and then practice on some small pieces, but I don't and always go back to using my walking foot. Wow!! You really made some beautiful and useful items! The fabric is lovely and the fact that it could help this nervous Nellie would be a bonus! Thanks for the giveaway. Wow... I was trying to figure out what to give my brother and his wife for their new daughter. I definitely have to make the changing mat.... Thanks for sharing all of the wonderful items you made. 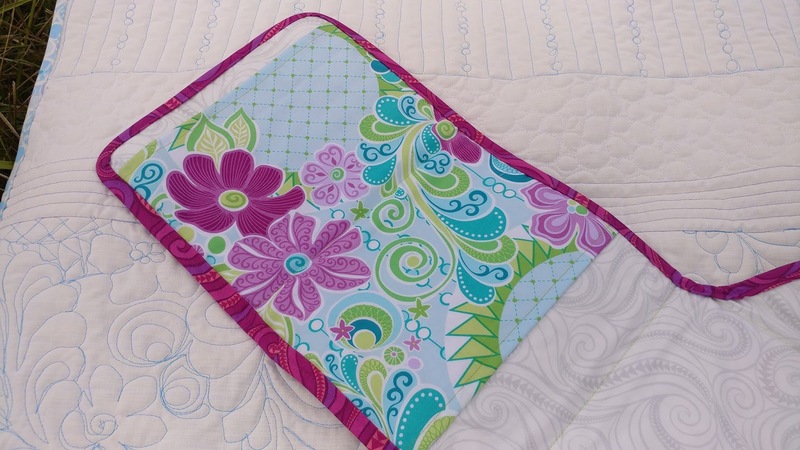 Your changing mat is beautiful and practical! I will keep this mind as an awesome gift for a new mom. As for free motion quilting, I feel comfortable with stippling, but not much beyond that. I love the idea of this fabric with a print to follow! What a beautiful set of useful items for your baby! I'm a nervous nellie when it comes to free motion quilting - but one of these days I'll get better at it. Thanks for the giveaway! 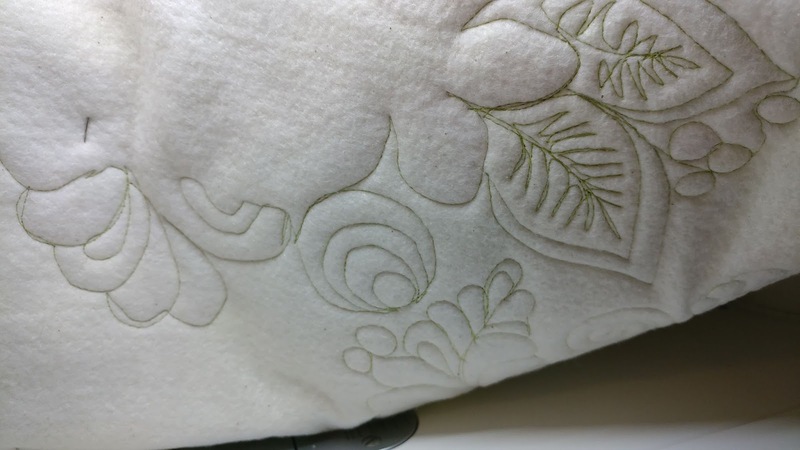 I love to free motion quilt and the Bernina Stitch Regulator mskes it so easy! Eager Beaver...reporting for duty. What am I doing this morning? Basting a quilt. What did I set up my machine for last night? FMQ! Halfway between nervous nellie and eager beaver haha! I start out with these grand ideas and intricate patterns and once I get going turn into nervous nellie about possibly destroying my quilt. How nice to have things for the new baby! I would love to try that fabric for FMQ. I was thinking about the vinyl the other day when things were sweating from the humidity. I am going to make a few for my table for the summer..kind of the reverse of a hot pad! Loved the idea of the pad and nursing cover, wish we had grandchildren to make these for. 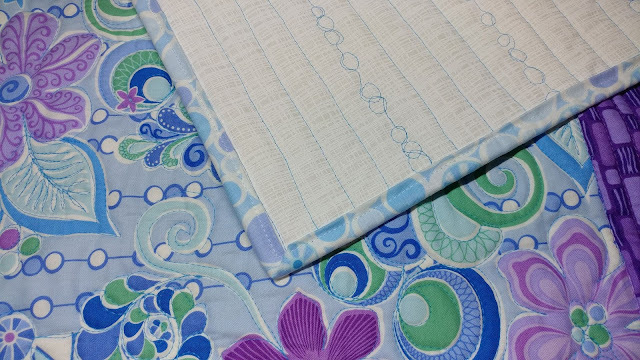 The fabrics shown are very nice, they have pretty designs and are cheerful in some of my favorite colors. 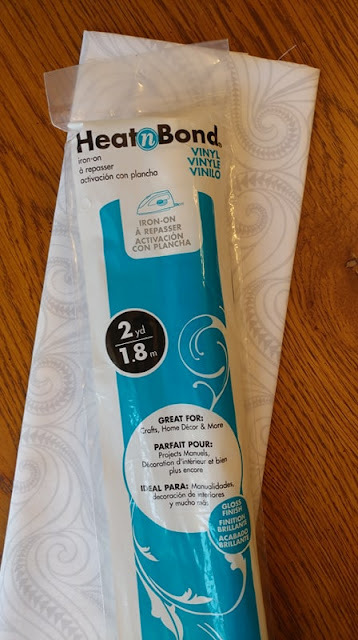 I like the placement of the back of the folded pad, the circle of the design could be embroidered with a name or phrase. Pretty nice! Your projects are Awesome, and soooo pretty!! Great job!! I am sooo much of a Nervous Nellie :/ here..but practicing more..and will soon try a bigger project :) Thank you for chance to win your Give-a-way...and for sharing how you made you baby things too..
LOVE those blues and greens. I am kept busy making clothes and things for my 15 mo old granddaughter, which she loves. Sounds like you have your hands full with 2 boys and another one on the way. Good luck. Thanks for the opportunity of winning some beautiful fabric. What a great quilt! 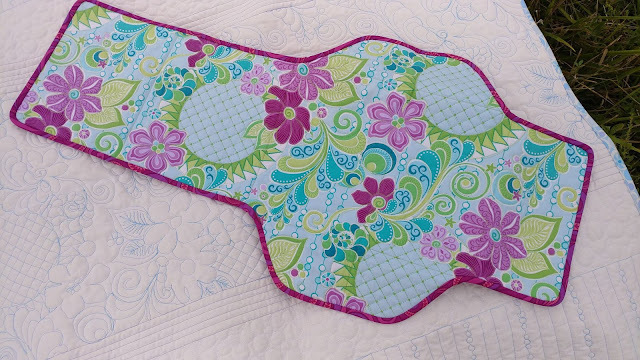 Love the way you used and quilted the print. I like to FMQ, but I take such a long time to finish a quilt top that every time I want to do some I have to learn all over again. Wow, you've been busy! I'm somewhere between nervous and eager. I struggle with what to quilt, but once I decide, I'm fine. This fabric does lend itself to FMQ, I'd like to try it! 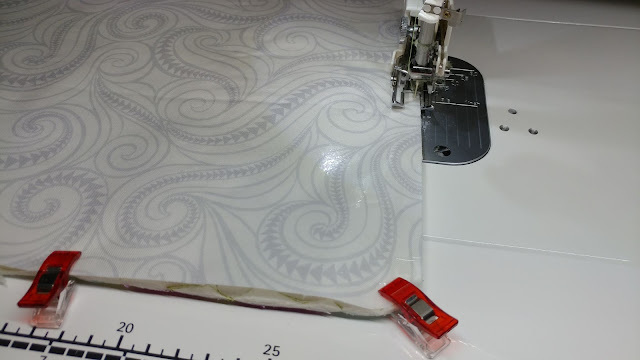 I've had a longarm for a long time, but before each project I'm still a nervous nellie! Afterwards I wonder what the big fuss was! I don't think I'll ever be an eager beaver, but I keep on trying. I admire anyone who can do the quilting and especially free motion. I've tried, but only on small things. The quilt is beautiful! Not quite an eager beaver, but free motion is becoming easier all the time (it is ruler work where I am a nervous Nellie novice). You really have made some wonderful items in preparation for the baby. I am in the nervous nellie camp, but I'm getting over that by making kennel quilts. I remind myself that the dogs don't care what the quilting looks like and that helps me practice with a bit less self-consciousness. Thank you so much for sharing all of your fabulous projects with us! My Niece just had her second baby and I have been stitching like crazy and having a blast making items for her and the baby. I am a Nervous Nellie, I avoid it as often as I can! 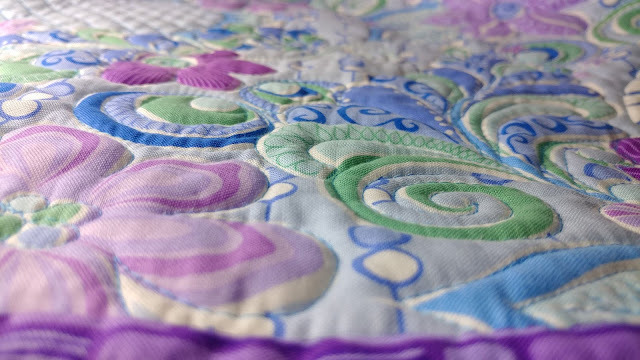 I'm comfortable with free motion quilting and have some favorite motifs I regularly use. 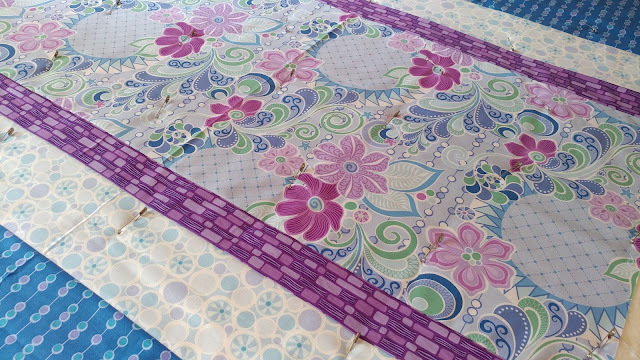 That lavendar print in the baby quilt is great. Good luck with the new baby. I love free motion quilting. I want to do all of a quilt myself - cutting, piecing and quilting. I'm still operation under "finished is better than perfect." I've recently become more adept at free motion quilting designs other than squiggles, but am still hesitant to trying the rulers! Your baby things are great and inspiration for some up-coming new babies in the family. I start off nervous...always worried about tension...then dive right into it. All your baby projects turned out adorable! Nervous Nellie for sure. I mostly imagine myself being good at it, but still haven't tried! You are such a prolific quilter and I love seeing your work. Very inspiring. An eager beaver here. I have practiced on several items before such as potholders and baby quilts. Practice is the thing that helps me get better. Free motion makes me nervous! Definitely a nervous nelly. Have just started doing curvy lines with my walking foot. Love the colors and patterns of yhe fabric and your creativity with them. Congratulations on the new baby. All of your projects are really adorable. 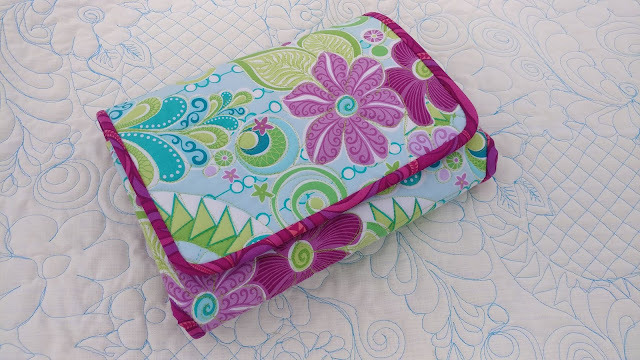 I am definitely a nervous nelly when it comes to free motion quilting. I am a “Eager Beaver” that is nervous about free motion quilting but willing to try anything. Thank you for the look at your beautiful made projects made from the beautiful fabrics. They will come in handy for sure. Good luck with your new little blessing! I'm a nervous Nelly, BUT I just got a new machine and my confidence is growing! On my domestic, nervous Nellie, on my long arm eager beaver. As my 4 year old grandson would say "just keep practicing". I love all the projects you did and the fabric is so yummy. I love to free motion quilt and try new things....just have to do lots of thinking. This fabric would make it so easy...let the fabric do the work!! Great projects. So pretty! 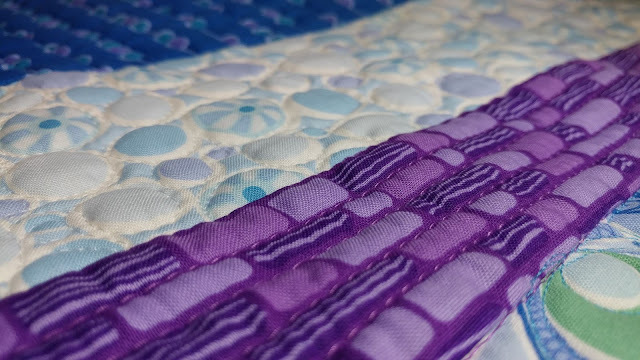 I really need more practice with free motion quilting! I'm a little bit of both. I have really enjoyed the simple FMQ I have done, but I'm scared of trying anything more challenging because I dont want to mess up any good fabric (and who has time to just practice!?). I don't enjoy FMQ on a standard sewing machine. Every time I have tried it, I haven't been happy with my results. 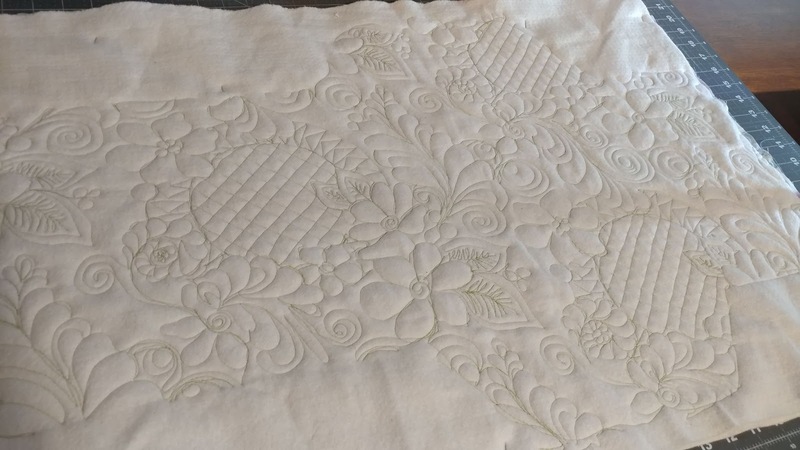 I really wanted to drive the machine instead of move the quilt sandwich so I purchased a longarm and enjoy freehanding but I am not so talented as some and find I tend to do meandering with some basic variations to coordinate with the different quilts I make. 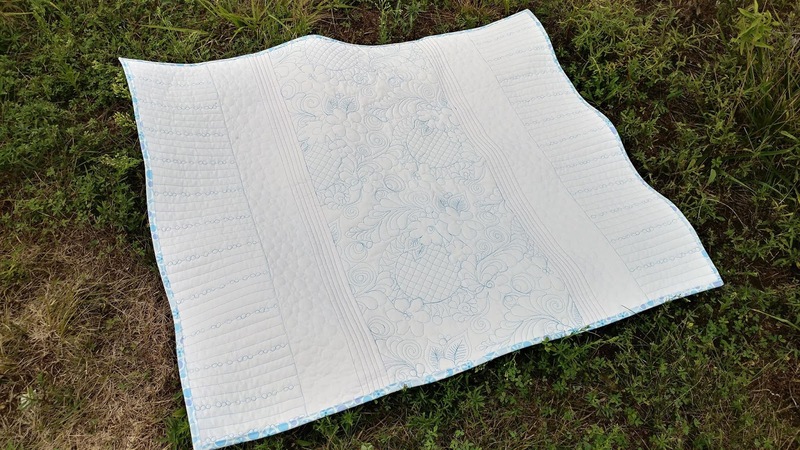 I'm always nervous about free motion quilting, but love how much it brings a quilt to life. Love seeing all the things you are making for #3!! I'm getting more confident with my free motion quilting. After I figured out that it doesn't have to be perfect, I have gotten better. A little nervous about free motion work but trying to practice. I am very hesitant to try free motion quilting. I have taken a class but it is still outside my comfort zone. I’m definitely an eager beaver with Free-motion Quilting. I love all of your projects, especially the wet bag. I love the way it turned out. I am still learning FMQ, but would call myself an eager beginner at this point. I took the plunge and got a longarm this year YEA!! Eager beaver but I have been doing it for a few years -- love doing it on wall hangings and baby quilts but usually farm out the big creations to long arm quilters as a business. Many times I use the fabric to inspire the quilting patterns. 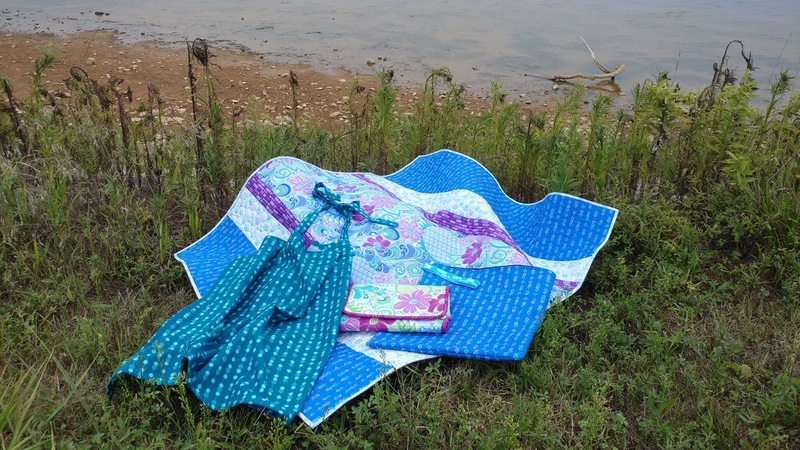 And we have had some good trunk shows from domestic machine quilters at our guild meetings that inspire and encourage. Eager beginner. I love practicing I keep batting and muslin by my machine all,the time. Drhodes9@cox.net. Your projects are perfect. I'm not a nervous Nellie or an eager beaver, kind of in between. Looks like you're all ready to welcome Baby #3 into the world with some amazing items. I have done a little FMQ but want to learn more!!!! I am nervous Nellie, LOL as I am not sure what I should put on my quilt. But I keep practicing on the basics. Think this fabric would be great to learn more and get more confident in my quilting. I am always nervous about it but I am a trooper and I just keep at it. Love the projects and the colors. I am a Nervous Nellie. I am still in the Nervous Nellie stage! You have made some beautiful accessories for your baby!! What a wonderful collection of projects for your new baby! The quilt is fantastic! A bit of both- I’vE done some free motion so i’m Comfortable with it but i’m Scared to try any quilting bigger than a baby blanket. I am somewhere in the middle. 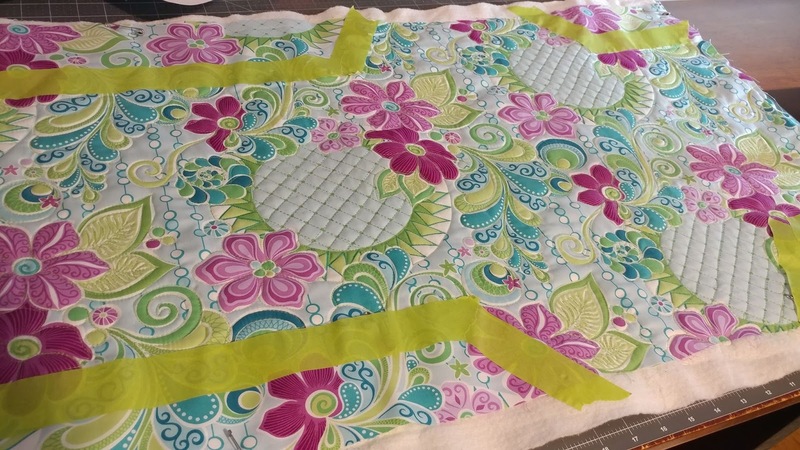 I am always nervous in the beginning but once I start, I love FMQ. So far I have been a straight line quilter who has only tried free motion on small stuff like mug rugs. Amanda's beautiful line of fabric may be just what I need! Great baby projects! I especially love the changing mat you made. As far as free motion quilting goes I'd say I'm more of a Nervous Nelly. I have been free motion quilting for several years. I love playing with designs and this fabric line would be fun to work with. Best wishes with baby #3. Is there something below a Nervous Nellie? I have tried free motion quilting a few times and it isn't as difficult as I thought but still makes me a complete nervous wreck. I can't say that I enjoy any part of the process except the final product. I am a Nervous Nellie!! 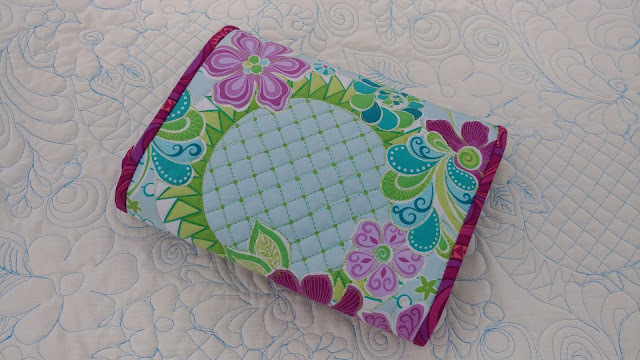 Your free motion quilting is beautiful. I hope someday to be as good!! Oh yes I love free motion quilting! Your changing pad is an awesome idea, but they are all awesome projects and now you are all ready for baby! I love to free motion and I have been doing it before it was popular. I still get a little nervous but usually only when I have to decide which design to use. Love your changing pad!!! 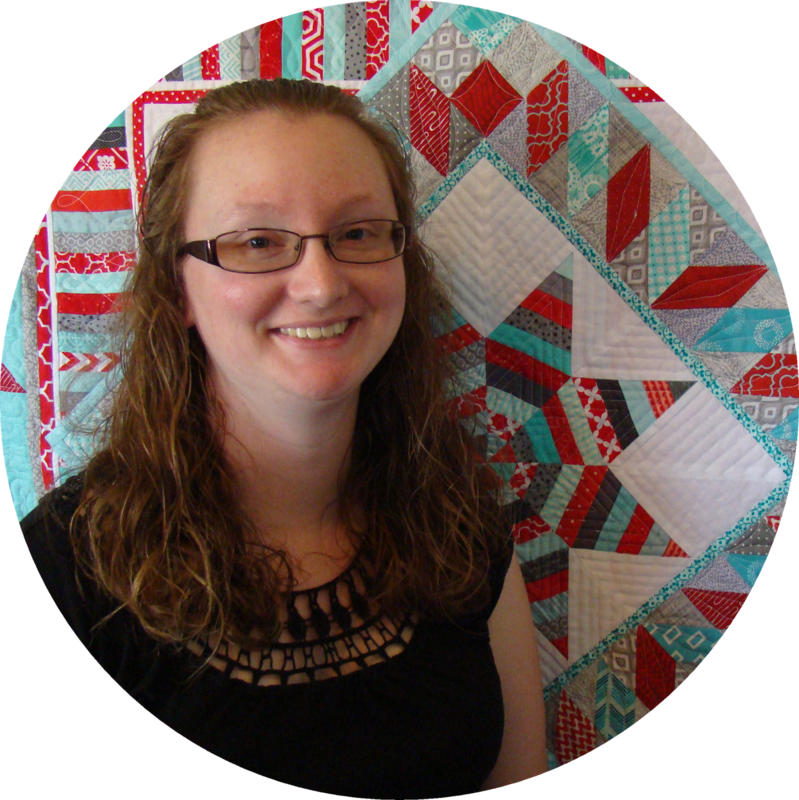 I am a Nervous Nellie when it comes to free motion quilting. I definitely need more practice. I am a nervous Nellie when it comes to FMQ. I'm an eager beaver for FMQ. I enjoy trying to quilt my own small projects even though I'm not very good at it. I just keep trying and hoping I'll get better at it! I enjoy FMQ. Always a challenge to pick the design that's going to best enhance the quilt. Love the way your projects turned out. Thanks for sharing. I'm a nervous Nellie. I've tried a couple times, and of course it looks awful. I need to make the time to keep after it. Definitely a Nervous Nellie but I just love the idea of following the fabric design. What darling projects! The fabrics are gorgeous in the colors you chose. I am definitely a nervous nelly, but am just getting started! I have free moron quilted 3 quilts so far and am still learning how to fill the spaces...this fabric is so neat! I'll have to give it a try sometime! Beautiful work. I am an eager beaver. I loved your idea following the swirls in the fabrics with quilting. 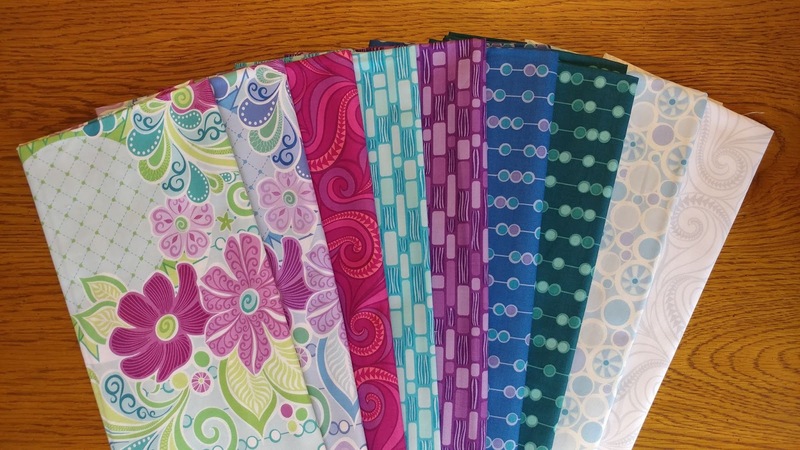 I am a Nervous Nellie, but these fabrics have me itching to try it. I just need more time. I'm a little bit of both! It's so much fun, but I'm so worried that I'll mess up my project! Thanks! Congrats on baby #3! I am a nervous nelly who wants to be an eager beaver! I need more practice, for sure. I love FMQ. I am a long arm owner wannabe! I have done quite a few quilts and I still get very nervous before I jump in. I always think about the galloping horse and just do it! I am always eager to start a FMQ project but then the final results are not much what I am excited over. I know practicing is important so I keep attempting. 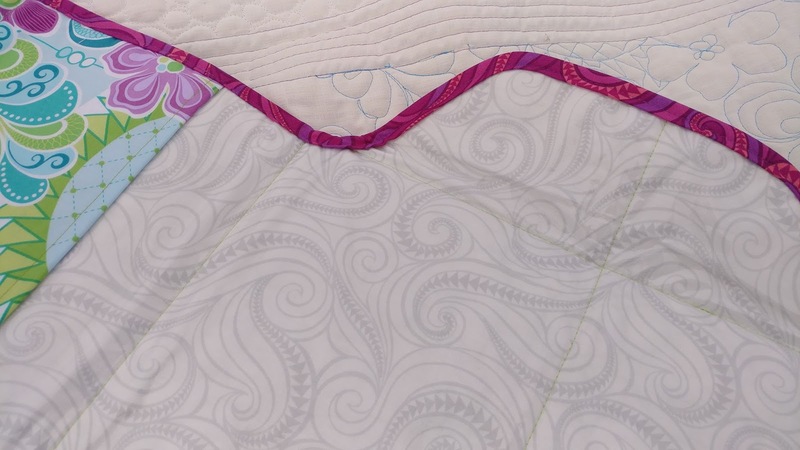 I love the design the quilting gave the back of your quilt! And thank you for sharing about the vinyl. I haven't seen it or heard of it as of yet and looking forward to giving it a try. Definitely an eater beaver when it comes to FMQ. My only problem is that I tend to do BIG projects, which makes FMQing on my DSM a little difficult. A bit of a Nervous Nellie, but trying to practicw more. I have only done FMQ stipples and swirls. I only get comfortable with FMQ after I have done some practicing. 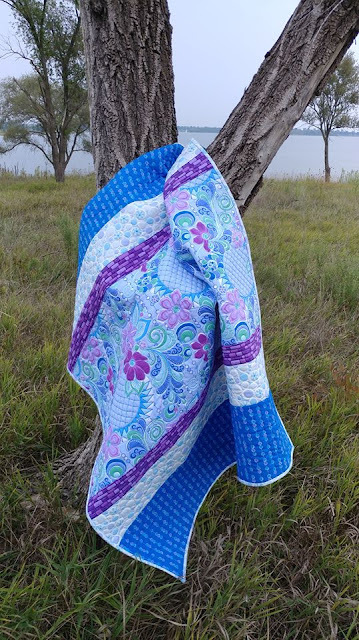 Your projects are just gorgeous, love the idea of using the fabric design for the quilting motifs. I get inspired to try FMQ every few years and then I get frustrated and give up until the cycle starts again. I've been slowly increasing the quilting designs I can do with straight lines, so my clcyes are wide apart but I'm due to try again, maybe I'll pick up some of the fabric and see if it helps. I'm really interested in how the iro-on vinyl holds up. YOur items for baby look great! I am not good at FMQ. I need more practice. I am learning FMQ'ing. Some things look fairly good, some really BAD!!! LOL It's a process! 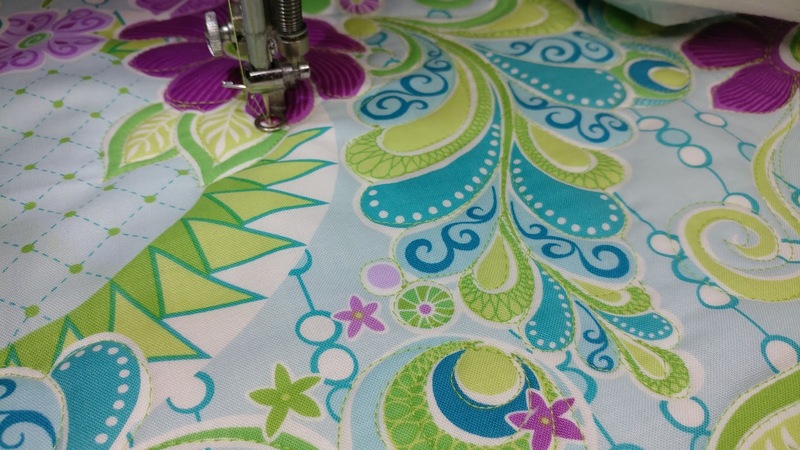 I adore FMQ with my longarm! So much fun! I certainly can't do it on my DSM. Love all the awesome things you have made! !